FILE - Rohingya children and refugees raise their hands and shout that they won't go back to Myanmar during a demonstration at Kutupalong near Cox's Bazar, Bangladesh, Jan. 22, 2018. The U.N. refugee agency opposes a recent agreement between Myanmar and Bangladesh to begin repatriating thousands of Rohingya refugees in the coming weeks. The UNHCR says conditions are not conducive for the safe, dignified return of the refugees to a country they fled more than a year ago to escape persecution and violence. The decision to begin the repatriation operation in mid-November comes about a week after U.N. investigators warned of an ongoing genocide in Myanmar. Bangladesh reportedly handed over to Myanmar the names of more than 5,000 Rohingya refugees who had been processed for return. U.N. refugee spokesman Andrej Mahecic tells VOA that Myanmar reportedly agreed to the list, but the Bangladeshi authorities must consult the refugees on whether they would like to return to Myanmar. "UNHCR was not involved in preparation, transmission or receipt of this list nor in the verification and clearing that was reportedly carried out by the Government of Myanmar," Mahecic said. "Because we consider that conditions in Rakhine state are not yet conducive for voluntary return in the conditions of safety, dignity and sustainability, UNHCR will not, at this stage, facilitate any refugee returns to Rakhine state." FILE - Flames engulf a house in Gawdu Zara village, northern Rakhine state, Myanmar, Sept. 7, 2017. 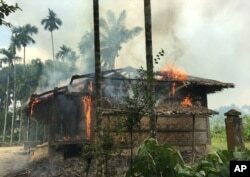 Security forces and allied mobs burned down thousands of homes in Northern Rakhine state, where the vast majority of the country's Rohingya lived. More than 700,000 Rohingya fled to Cox's Bazar at the end of August 2017, in the wake of a brutal crackdown by the Myanmar military, including killings, rapes and arson attacks. The United Nations reports Rohingya continue to flee Myanmar, with more than 14,000 refugees arriving in Bangladesh this year. The Rohingya have lived as a stateless people in Myanmar for more than six generations. Mahecic says it is up to the Myanmar authorities to create the conditions for refugee returns, which include granting the Rohingya citizenship, freedom of movement, access to education and other basic services and rights available to the rest of the population.